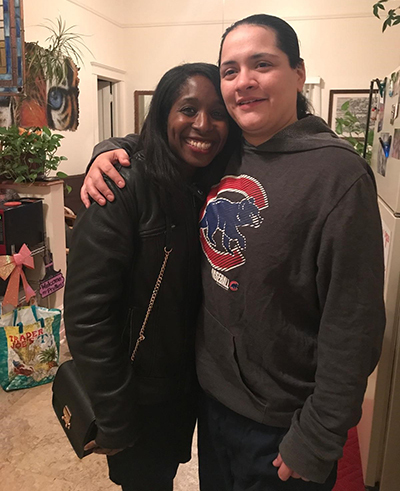 Andrea Lewis, clinical assistant professor of law, celebrates with her client Kerry Masterson (right) on the day of her release. After spending more than eight years in prison, Kerry Masterson, a joint client of Northwestern Pritzker School of Law’s Center on Wrongful Convictions and Neal Gerber Eisenberg, is free following a jury’s not-guilty verdict in the Circuit Court of Cook County on November 2. At the second jury trial, which began on October 27, 2017, the defense called expert witness Dr. Brian Cutler, a psychology researcher from the University of Ontario Institute of Technology. Cutler explained how the conditions under which the eyewitnesses saw the perpetrator and the manner in which the lineups were conducted increased the risk of mistaken identification. Masterson, now 31 years old, testified that she was not involved in the crime in any way and, instead, during the commission of the murder, she was trying to fix her truck, which was parked nearby. The couple arrested for the murder, who pleaded guilty years ago, testified at the second trial as well. The couple, who admitted they were affiliated with a Chicago street gang, testified that they had lied to the police in implicating Masterson to mitigate their own punishment, and implied that they would have faced violent gang retaliation had they revealed to the police that the third perpetrator was actually a male gang member. The second jury found Masterson not guilty on November 2, 2017, after less than three hours of deliberation. “We are elated that, after careful consideration of all the evidence presented in the case, including the scientific findings in the area of eyewitness identifications and the heartfelt testimony of Ms. Masterson, the jury found she was not guilty. We hope, as administrative procedures and the law change surrounding eyewitness identifications, that the risk of further mistaken identifications decreases dramatically," said Lewis. "It is enormously gratifying, both professionally and personally, to have been a part of such a talented and dedicated team of lawyers. We are thrilled to have been able to allow Kerry Masterson to return to her friends, her family — her life. When the jury announced its verdict, I was and still am reminded of the Talmudic teaching, ‘He who saves a single life saves the entire world,’” said Quinn.